Those who’ve been following the lawsuit filed on behalf of Avielle Hernandez daughter, of the disgraced New England Patriots tight end convicted of murder, who then was revealed as a tragic casualty of CTE, are already aware of the NFL’s attempts to rewrite her lawsuit to plead things she never asserted and dismiss the allegations she actually presented. In their attempt to box young Avielle (referenced as A.H. in some court documents) into the class of retired players eligible for settlement benefits, they now seek to impose their own timeline, viewing the past from the future. This brief courtroom scene occurred on April 13, 2017. It was the last time Avielle Hernandez saw her father alive. Four days later, on April 19, after having been found “not guilty” in the double murder trial, Hernandez committed suicide in his prison cell. The following September Boston University researchers announced their findings on Aaron Hernandez’s brain. “The brain scan came as a surprise even to researchers who for years have been studying the relationship between brain disease and deaths of professional football players,” wrote Ken Belson in the New York Times. The brain of twenty-seven-year-old Aaron Hernandez showed such severe atrophy that the damage resembled that of players who died in their 60s. According to Dr. Ann McKee, this was the most severe case of CTE ever seen in a person so young. Aaron Hernandez’s survivors and their attorneys realize this much brain damage didn’t accumulate during Hernandez’s brief, 3-year NFL career. The lawsuit filed on behalf of his daughter indicates that it was not the time he spent in the NFL which led to Aaron’s demise, and possibly the erratic and violent behavior that preceded it. Instead, it was repetitive hits to Aaron’s head over the course of twenty years of football exposure, which the NFL represented as safe that destroyed Aaron Hernandez’s brain and left his daughter without a father. This is the crux of the lawsuit and the NFL wants to kill those claims by doing whatever it takes to keep the lawsuit from advancing to trial. Several points are incorporated in the NFL’s strategy, but the two primary positions advanced are: To rewrite Avielle’s lawsuit to their own liking so they can argue LMRA preemption on the basis of her father’s NFL employment or find a way to place her in the settlement class which would completely extinguish her rights since she neither opted out nor registered for participation. The first argument is presented in detail in a previous article. 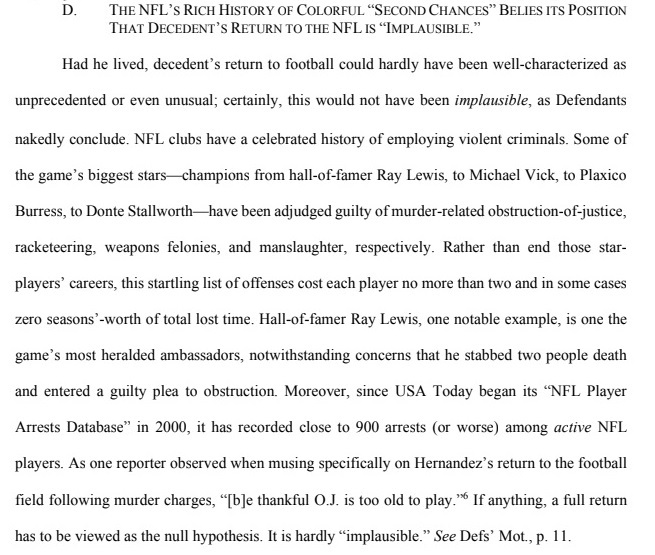 Since then additional briefs have been filed by both the NFL and Hernandez. 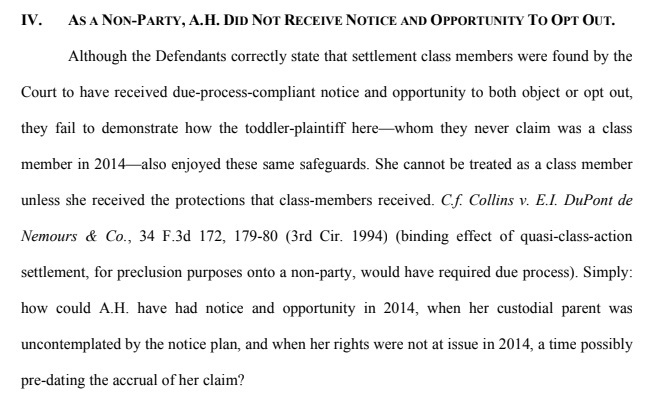 The recent memorandum of law filed by the NFL incorporates twenty-six pages purposed to convince the court that the child is a member of the settlement class. In order to do this, they must ignore historical timelines and reconstruct them to their liking. As the reader can see, they hope to evade the strong arguments for remand presented by Avielle’s attorney, Brad Sohn. The arguments for remand are compelling and the NFL hopes to see the case dismissed before they are forced to concede preemption doesn’t apply to this lawsuit and the merits of the case are addressed. 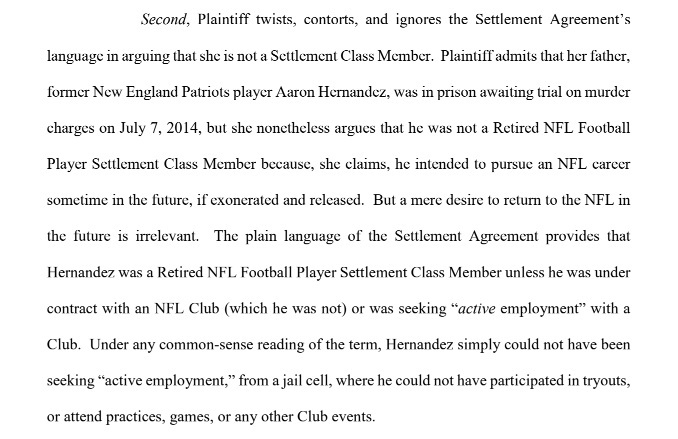 The NFL argues that Aaron Hernandez was a retired football player which would have made him a class member to the settlement and his daughter a derivative claimant, by default. The paragraph below capsizes their argument. Despite the irony of the NFL completely twisting the entirety of Avielle’s complaint to their own liking, they accuse the child’s counsel of contorting the language of the settlement agreement to argue that Hernandez was not retired on July 7, 2014, the retirement cut-off date for the NFL settlement. While on the surface it looks like a strong argument a closer examination reveals they are merely entering a time machine and attempting to rewrite history. 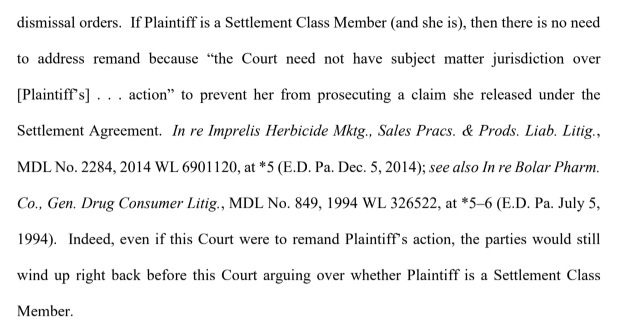 He further writes, “the face of the Complaint does not address whether the decedent sought a return to football. This is a collateral issue to the pleading, and one Defendants would need to develop later in the litigation. Therefore, a Court could not reach the question of whether the decedent was “retired” on a 12(b)(6) motion.” The Rule 12(b)(6) motion referenced is the NFL’s motion to dismiss for failure to state a claim. Sohn says that it’s premature to decide the motion without the benefit of discovery. Sohn demonstrates that the NFL didn’t consider Hernandez retired upon his arrest, release by the Patriots, and pre-trial incarceration. “Prior to the resolution of the charges pending against him,” is a key phrase. 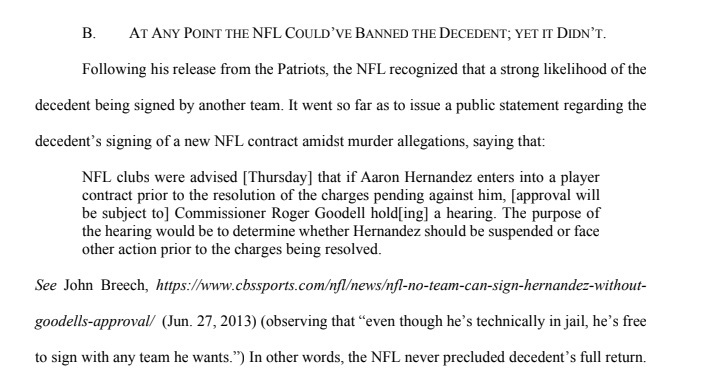 It was nearly a year after the opt-out deadline when on April 15, 2015, Hernandez was convicted of the murder of Odin Lloyd; therefore this is the date referenced in Goodell’s statement. Had the jury decided differently, it’s almost certain Hernandez would have returned to the NFL. This should be the earliest date that Hernandez might have been considered retired but presumably, he would continue to consider himself a current player, albeit sidelined until his appeal was heard. As of the time of his death, his appeal was still pending. A records release obtained by Deadspin’s Diana Moskovitz referenced his intent to return—even in the days preceding his suicide. This statement was widely reported by numerous news outlets and is contained in Sohn’s reply brief. In August 2013, a Rolling Stone writer predicted that Hernandez would be playing again in “three or four years.” “I think they’ve grossly overcharged him based on the case they’re building — no direct eye witness, no murder weapon [and] no plausible motive,” said Paul Solotaroff on CBS Sports Radio. During the Odin Lloyd murder trial debate.org posted a poll that asked if Hernandez was found “not guilty” should he be allowed to return to the NFL. Results were split 50/50. 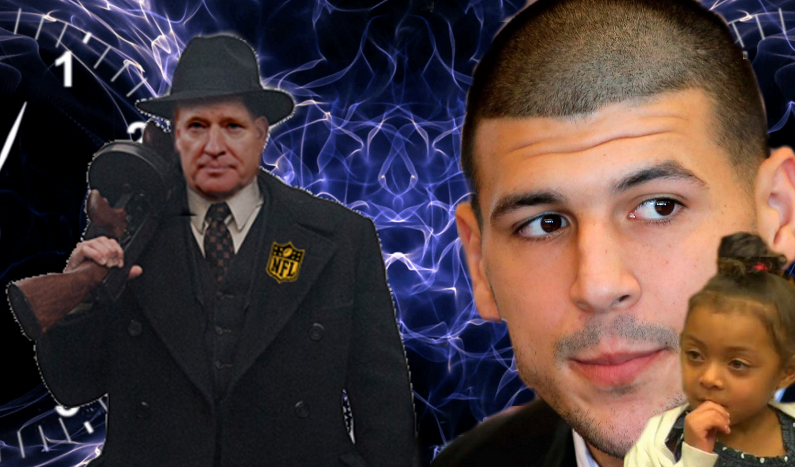 These are but a few of the media speculations as to Hernandez’s return to the NFL. It doesn’t seem that an NFL spokesperson bothered to inform them Hernandez was “retired.” Probably because no one including the NFL viewed him as retired prior to his death and a lawsuit that would be much easier for the NFL if they convince the court he retired. Sohn recalls “the NFL’s rich history of colorful second chances,” stating the NFL’s claim of Hernandez’s return certainly wasn’t “implausible” as the NFL continues to insist. Numerous players have returned to the NFL following extended absences for varied reasons in addition to those mentioned in the brief. In 1998 Steve DeBerg returned to the NFL after 4 years away from the league, at age 44. Running back Marcus Dupree returned to the Rams in 1990 after a 5-year hiatus. Deion Sanders took a four-year sabbatical from the NFL following a toe injury and returned in 2004 to play two more seasons. He was in his late thirties when he made his comeback. On July 7, 2014, Aaron Hernandez was a star player in his prime at age 24 who’d been arrested but not convicted of any crime. Was his return at that time implausible? Hardly. 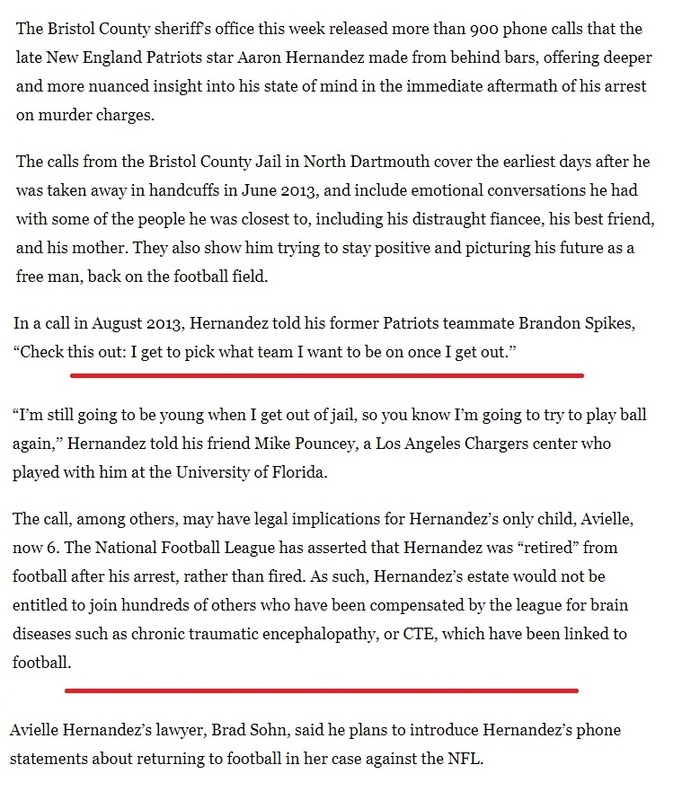 The NFL uses news articles to prove Hernandez was in jail. No one argues to the contrary, but the fact he was an unconvicted accused sitting in a jail cell doesn’t equate to retirement. 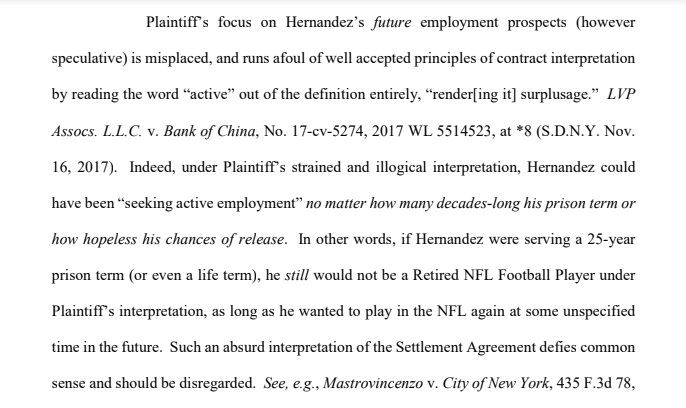 If the NFL wished to prove Hernandez had retired and was a member of the settlement class they could have produced retirement paperwork. That is if retirement paperwork existed, which it did not. Perhaps they could have shown that he took severance pay- a benefit taken by players at retirement. No. That doesn’t work because he didn’t request severance pay either. Instead, Hernandez filed a grievance regarding his contractual release by the Patriots represented by the NFLPA, which readily admits, representation of active and not retired players. Sohn also points out that the NFL’s sweeping definition of “retired” defies basic principles of contract law. In equating “not under contract” as the defining principle of the retirement cut-off date, it’s likely there are retired players currently playing on squads throughout the NFL who are clueless to the fact they retired back in 2014, along with the owners who are needlessly paying them for their work rather than forcing them to file for retirement benefits. The NFL clings to the phrase “seeking active employment” and arrives at the conclusion that Hernandez could not seek employment because he was unavailable to participate in training camps, practices or games, but neither could players who were inactive because of injury, indefinite suspension, or the Commissioner’s Exempt list. It seems reasonable to believe that Hernandez made his wishes and intent known to his agent and was held up only by an unknown availability date in much the same manner as an unsigned injured player unsure of rehab time or an unsigned player on indefinite suspension. 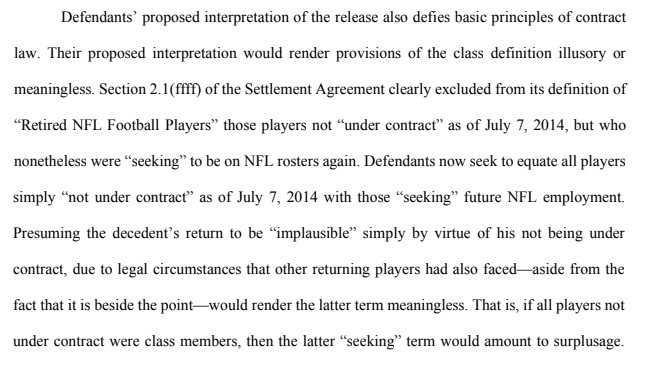 The NFL calls Plaintiff’s focus on future employment “absurd” by citing conditions that were not relevant on July 7, 2014. Hernandez had been arrested and jailed but was not convicted until April 15, 2015, over nine months beyond the retirement date cut-off. Had he been exonerated on that date, he would most likely be playing in the NFL today. If one accepts the NFL’s reasoning, then arrest means an automatic conviction where the concept of “innocent until proven guilty” can be tossed out the window, trials abolished, verdicts rendered, and sentencing done at the time of apprehension. The NFL addresses notice in saying that law doesn’t require Settlement Class members to receive an actual notice of the settlement. The longform notice does provide the settlement definition and is the only document in circulation to my knowledge that even attempted to define retirement. 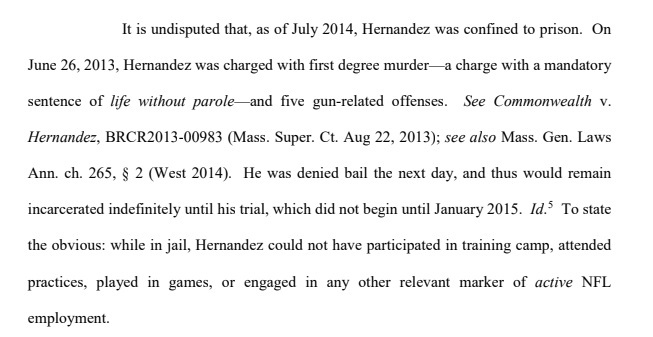 This doesn’t give much clarity for Hernandez’s situation even if he saw it by chance. He and other players who were at a standstill in their careers were not addressed. In all likelihood, some of these players returned to the field. A few may still be playing. Others, who were unable to find work either reluctantly hung up their cleats at some point or accepted employment with the CFL or Arena Football. Only they can make the true call on their retirement dates. This class definition that made its way around alumni circles (that I was able to dig out after much paper scrounging) gives no indication that Hernandez would be included. Why would it when alumni, by definition are people who understand they are retired? The pre-registration notice issued on January 7, 2017 which informs players of the deadline to register for the settlement doesn’t provide any clarity either. It does, however state that eligible players would receive an individual notice, contrary to what the NFL attempts to portray for Hernandez, his fiancée and daughter. The NFL cites the opt-out deadline included in notices that were sent to players who were actually retired. As mass torts go, the NFL settlement is relatively small and consists of a reasonably easy population to locate and contact. Aaron Hernandez’s whereabouts were no secret. 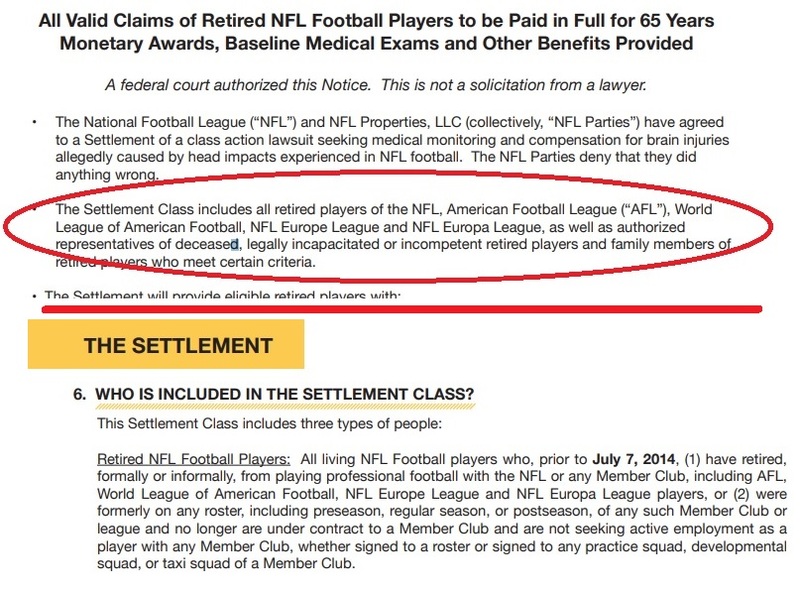 Retired players with known addresses received personal notification but Hernandez did not, This would reflect that the NFL did not view him as a retiree at the time the opt-out deadline expired, or any time thereafter until Avielle’s lawsuit was filed and it became convenient for them to lump the father and daughter retroactively into the class, with no ability to make claims because of a registration deadline in August 2017. While the bulk of the NFL brief attempts to rewrite the chronology of Aaron Hernandez’s conviction and involuntarily retire him from the NFL, other evidence and logical reasoning show this is not applicable to Aaron or Avielle’s situation. While the NFL’s main goal seems to be to travel back in time and retire Hernandez prematurely, should “Plan A” fail, they present as “Plan B” that Avielle is an opt-out whose claim should be preempted. She cannot be both a class member and an opt-out and it should be quite apparent that she’s neither. Their attempt to capture her as an opt-out has troubling implications for anyone who may file a lawsuit against the NFL, including players who are currently active in the league and develop problems that either force their retirement or develop during post-career. If the court should accept the NFL’s “Plan B” arguments, then current players have already ceded any right to make their own claims against the league, its teams, doctors, or any other related party such as a helmet manufacturer. I’ll explain further when I continue the breakdown in a separate article. Stay tuned.